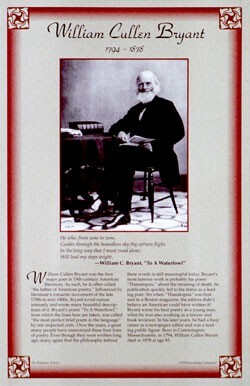 This unique educational poster features a photo of the great 19th century American poet William Cullen Bryant, as well as a quote from "To a Waterfowl," and concise biographical text summarizing his life and career. 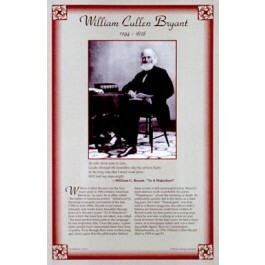 William Cullen Bryant is often called "the father of American poetry." A part of the Romantic tradition in literature, Bryant loved nature and wrote beautifully about it. His poem "To a Waterfowl" was called "the most perfect brief poem in the language." This poster is a great way to introduce students to this great American poet.